Oklahoma Gazette’s mission is to stimulate, examine and inform the public on local quality-of-life issues and social needs, recognize community accomplishments and provide a forum for inspiration, participation and interaction across all media. Twenty-one percent of the Oklahoma City metro population reads Oklahoma Gazette. It’s the largest weekly newspaper in the state, and our editorial, design, advertising and marketing departments have all won state, regional and national awards for excellence. 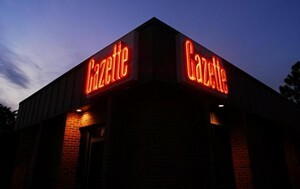 Oklahoma Gazette prints and distributes 40,000 papers every Wednesday in and around Oklahoma City and Central Oklahoma. Our cume readership is 207,164 readers who read our newspaper at least once per month. Our readers are high-income, highly educated influentials who are active in the community. The mean age of a Gazette reader is 37 and the average household income is $59,174 — substantially higher than the market average. Forty-two percent of Gazette readers have a college degree. Impressive, right? As you might expect, people who read Oklahoma Gazette are more likely to drink wine, attend concerts and dine out at a restaurant. To learn more about our readers, contact us. It started as a labor of love, a desire to cover and report news in a fresh, unique and unfettered format, and Oklahoma Gazette’s first issue circulated 2,000 copies on October 15, 1979. Over the years, we’ve grown a lot. Oklahoma Gazette’s success is due to the dedication of countless staff members, the vision of Founder Bill Bleakley, and the energy and ambition of new Publisher Pete Brzycki. Fiercely local and independent, like its publisher, Oklahoma Gazette focuses on quality-of-life issues and serves as the metro area’s arts and entertainment authority, now circulating 43,000 copies each week and reaching over 134,070 weekly readers.